Find my bike, get karma! 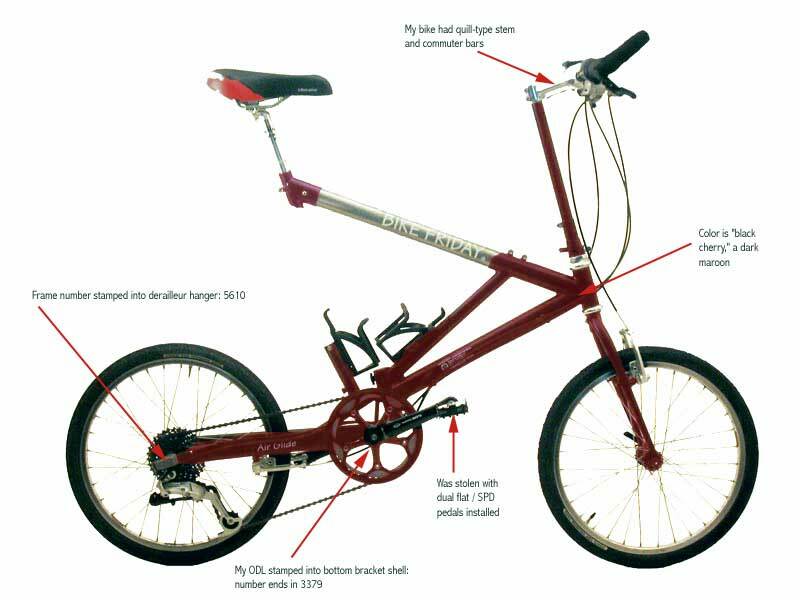 Stolen around September 26, 2003 from the cages behind the Atrium building, 10th Ave. and Olive Street. It's a Bike Friday AirGlide in "Black Cherry," a dark maroon color. It's stamped with both a frame number and my driver's license number. This photo is not my bike, but I have color-corrected it to make it look closer to mine. The stem and handlebars on mine were different. Click to enlarge the image. Send me e-mail at me@steveransom.com if you've found it. If you're in Eugene/Springfield, take it to Bike Friday at 3364 W 11th or call them at 800-777-0258.